We produce 100% mohair rugs, wall hangings, bags and tablemats made from high quality, hand-spun and dyed mohair. 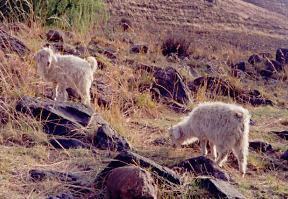 The mohair is sourced from Lesotho farmers that own angora goats. 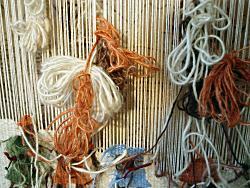 The warp of our weavings is made of cotton twine. Our flat-weave pieces are roughly 1 cm thick. They are of outstanding quality and the unique mohair wool makes them stand out internationally when compared with other tapestries and rugs. Many of our traditional designs reflect a variety of Basotho rituals and aspects of village life. Others celebrate the San Bushmen heritage of Lesotho by depicting their cave paintings. We are, however, expanding our product line to include a more modern and abstract use of traditional Litema patterns (see the “Litema” sidebar for more information on these designs). All designs are created by our in-house Mosotho designer, ‘M’e Malimakatso. We also produce custom designs and are adept at weaving company logos. 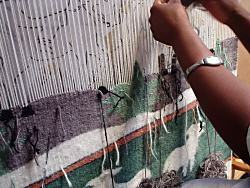 From start to finish, our weavings are made entirely by hand. 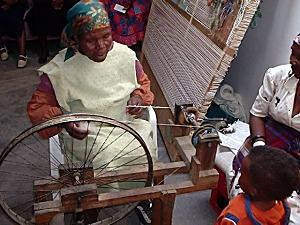 First, we buy mohair from local Basotho farmers which is then carded and spun by our spinners. 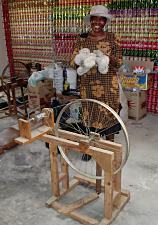 Spinning is done using hand-made spinning wheels that employ an old bicycle wheel. Once the spinning is completed, we wash and dye the mohair in our studio. When the mohair is dry, bobbins are prepared and they are woven into beautiful work on our simple wooden frames. 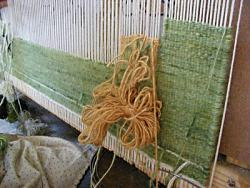 We lay a warp of cotton twine and then place a design behind the warp. 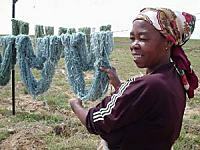 Once the weaving is finished, it is cut off the loom and each weaver sews and finishes her piece. From there they are displayed in our showroom, brought to local lodges or shipped overseas. Our weavers can follow nearly any design and weave, entirely by hand, an incredible variety of work. To ensure the long-term quality of our weavings, all of our wool is moth-proofed before it is used. The dyes are set and will not run during cleaning. 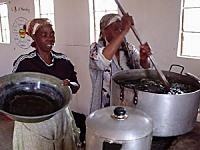 It is best to wash the weavings by hand in cold water with a gentle soap, like Sunlight dish soap.